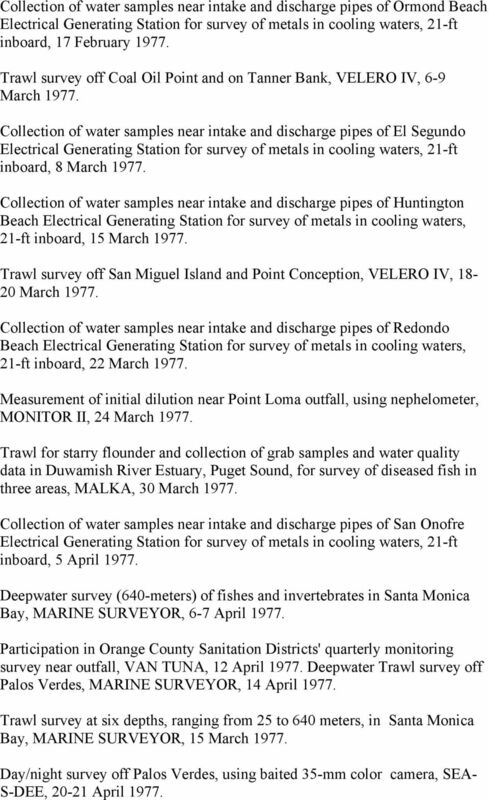 Download "Appendix D SAMPLING AT SEA"
1 Appendix D SAMPLING AT SEA During the past year. Project personnel conducted or participated in 131 cruises involving over 356 man-days at sea. 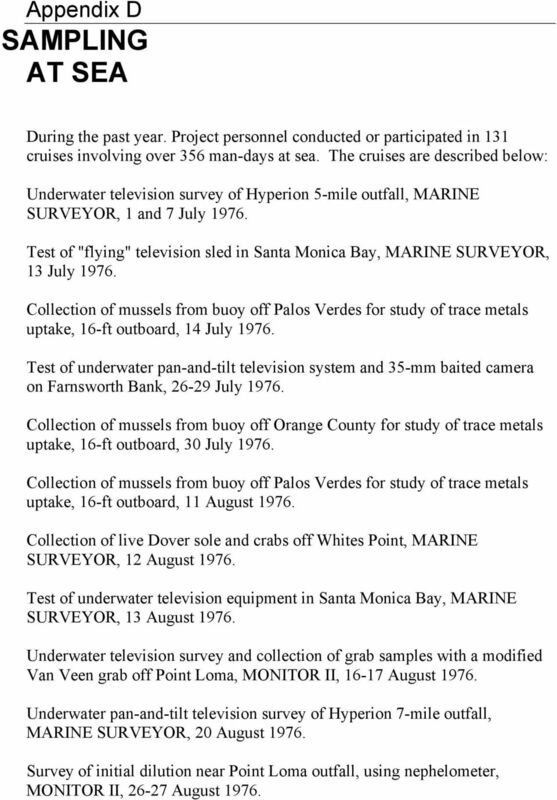 The cruises are described below: Underwater television survey of Hyperion 5-mile outfall, MARINE SURVEYOR, 1 and 7 July Test of "flying" television sled in Santa Monica Bay, MARINE SURVEYOR, 13 July Collection of mussels from buoy off Palos Verdes for study of trace metals uptake, 16-ft outboard, 14 July Test of underwater pan-and-tilt television system and 35-mm baited camera on Farnsworth Bank, July Collection of mussels from buoy off Orange County for study of trace metals uptake, 16-ft outboard, 30 July Collection of mussels from buoy off Palos Verdes for study of trace metals uptake, 16-ft outboard, 11 August Collection of live Dover sole and crabs off Whites Point, MARINE SURVEYOR, 12 August Test of underwater television equipment in Santa Monica Bay, MARINE SURVEYOR, 13 August Underwater television survey and collection of grab samples with a modified Van Veen grab off Point Loma, MONITOR II, August Underwater pan-and-tilt television survey of Hyperion 7-mile outfall, MARINE SURVEYOR, 20 August Survey of initial dilution near Point Loma outfall, using nephelometer, MONITOR II, August 1976. 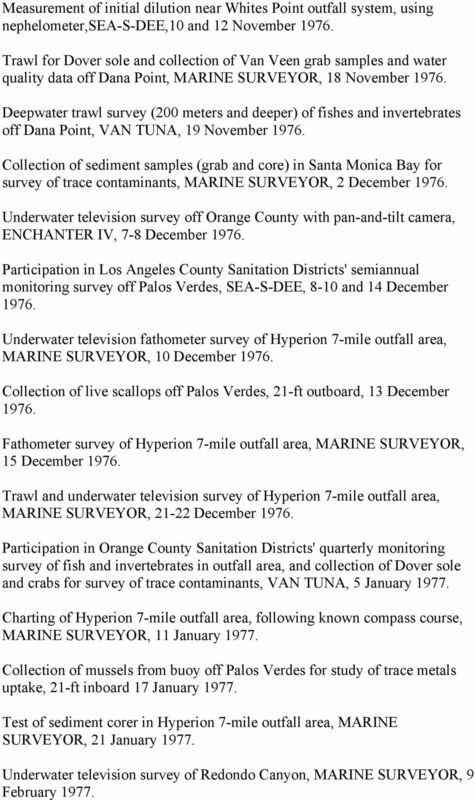 2 Collection of Van Veen grab samples north and south of Hyperion 7-mile outfall for survey of PCB's, MARINE SURVEYOR, 31 August Trawl for live fish and crabs off Dana Point, MARINE SURVEYOR, 2 September Trawl for Dover sole off Palos Verdes for fish disease study, MARINE SURVEYOR, 23 September Trawl for Dover sole (control fish for disease study) and collection of data on all fish and invertebrates from a previously unsampled area Point Dume, MARINE SURVEYOR, 28 September Trawl in deep water (500 meters) off Palos Verdes, MARINE SURVEYOR, 29 September Measurement of initial dilution near Point Loma outfall, using nephelometer, MONITOR II, 4-5 October Test of water sampling pump and motor at depth in Santa Monica Bay, MARINE SURVEYOR, 7 October Measurement of initial dilution near Orange County outfall, using nephelometer, ENCHANTER IV, 12 October Measurement of initial dilution near Hyperion 5-mile outfall, using nephelometer, MARINE SURVEYOR, 19 October Measurement of initial dilution near Whites Point outfall system, using nephelometer, SEA-S-DEE, 21 October Collection of purple-hinged rock scallops from Point Dume and Dana Point for survey of trace metals in sport fish, 21-ft Glastron, October Collection of black abalone and red sea urchins from Whites Point area for survey of trace metals in sport fish, 21-ft Glastron, 31 October Trawl for live Dover sole and collection of Van Veen grab samples and water quality data off Palos Verdes, MARINE SURVEYOR, 5 November Deepwater survey (500 meters) of fishes and invertebrates off Palos Verdes, MARINE SURVEYOR, 9 November Collection of purple-hinged scallops off Whites Point for study of trace metals uptake, 21-ft outboard, 10 November 1976. 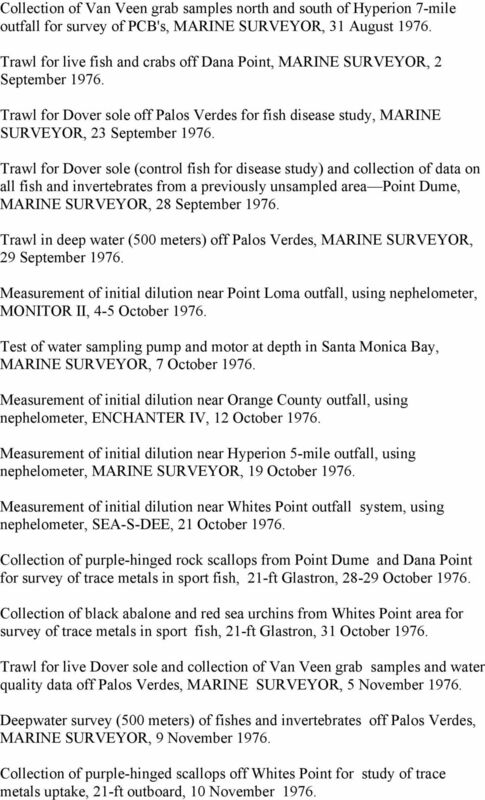 3 Measurement of initial dilution near Whites Point outfall system, using nephelometer,sea-s-dee,10 and 12 November Trawl for Dover sole and collection of Van Veen grab samples and water quality data off Dana Point, MARINE SURVEYOR, 18 November Deepwater trawl survey (200 meters and deeper) of fishes and invertebrates off Dana Point, VAN TUNA, 19 November Collection of sediment samples (grab and core) in Santa Monica Bay for survey of trace contaminants, MARINE SURVEYOR, 2 December Underwater television survey off Orange County with pan-and-tilt camera, ENCHANTER IV, 7-8 December Participation in Los Angeles County Sanitation Districts' semiannual monitoring survey off Palos Verdes, SEA-S-DEE, 8-10 and 14 December Underwater television fathometer survey of Hyperion 7-mile outfall area, MARINE SURVEYOR, 10 December Collection of live scallops off Palos Verdes, 21-ft outboard, 13 December Fathometer survey of Hyperion 7-mile outfall area, MARINE SURVEYOR, 15 December Trawl and underwater television survey of Hyperion 7-mile outfall area, MARINE SURVEYOR, December Participation in Orange County Sanitation Districts' quarterly monitoring survey of fish and invertebrates in outfall area, and collection of Dover sole and crabs for survey of trace contaminants, VAN TUNA, 5 January Charting of Hyperion 7-mile outfall area, following known compass course, MARINE SURVEYOR, 11 January Collection of mussels from buoy off Palos Verdes for study of trace metals uptake, 21-ft inboard 17 January Test of sediment corer in Hyperion 7-mile outfall area, MARINE SURVEYOR, 21 January Underwater television survey of Redondo Canyon, MARINE SURVEYOR, 9 February 1977. 4 Collection of water samples near intake and discharge pipes of Ormond Beach Electrical Generating Station for survey of metals in cooling waters, 21-ft inboard, 17 February Trawl survey off Coal Oil Point and on Tanner Bank, VELERO IV, 6-9 March Collection of water samples near intake and discharge pipes of El Segundo Electrical Generating Station for survey of metals in cooling waters, 21-ft inboard, 8 March Collection of water samples near intake and discharge pipes of Huntington Beach Electrical Generating Station for survey of metals in cooling waters, 21-ft inboard, 15 March Trawl survey off San Miguel Island and Point Conception, VELERO IV, March Collection of water samples near intake and discharge pipes of Redondo Beach Electrical Generating Station for survey of metals in cooling waters, 21-ft inboard, 22 March Measurement of initial dilution near Point Loma outfall, using nephelometer, MONITOR II, 24 March Trawl for starry flounder and collection of grab samples and water quality data in Duwamish River Estuary, Puget Sound, for survey of diseased fish in three areas, MALKA, 30 March Collection of water samples near intake and discharge pipes of San Onofre Electrical Generating Station for survey of metals in cooling waters, 21-ft inboard, 5 April Deepwater survey (640-meters) of fishes and invertebrates in Santa Monica Bay, MARINE SURVEYOR, 6-7 April Participation in Orange County Sanitation Districts' quarterly monitoring survey near outfall, VAN TUNA, 12 April Deepwater Trawl survey off Palos Verdes, MARINE SURVEYOR, 14 April Trawl survey at six depths, ranging from 25 to 640 meters, in Santa Monica Bay, MARINE SURVEYOR, 15 March Day/night survey off Palos Verdes, using baited 35-mm color camera, SEA- S-DEE, April 1977. 5 Deepwater trawl survey (500 meters) of Dover sole populations between the Hyperion and Whites Point outfalls, MARINE SURVEYOR, 27 April Trawl survey at 60-meter depths in Santa Monica Bay, MARINE SURVEYOR, 28 April Participation in Orange County Sanitation Districts' quarterly monitoring survey, VAN TUNA, 2 May Trawl survey at 60-meter depths off Orange County, FURY II, May Participation in Los Angeles County Sanitation Districts' semiannual monitoring survey, SEA-S-DEE, and May Trawl survey at 60-meter depths between Point Conception and Point Dume, MARINE SURVEYOR, 1-3 June Day/night survey off Orange County, using baited 35-mm color camera, ENCHANTER IV, 2-3 June Trawl survey in New York Bight for study of diseased fish in three areas, DELAWARE II, 6 June Day/night survey in Redondo Canyon, using baited 35-mm color camera, STRAIGHT ARROW II, 8-9 June Diving survey of rocky bottom communities off Palos Verdes, 21-ft inboard, 8-9 June Trawl survey in New York Bight for study of diseased fish in three areas, RORQUAL, 9 June Collection of water samples near intake and discharge pipes of Huntington Beach Electrical Generating Station for survey of trace metals in cooling waters, 21-ft inboard, 14 June Day/night survey in Santa Monica Bay, using baited 35-mm color camera, June Collection of water samples near intake and discharge pipes of Redondo Beach Electrical Generating Station for survey of trace metals in cooling water, 21-ft inboard, 20 June 1977. 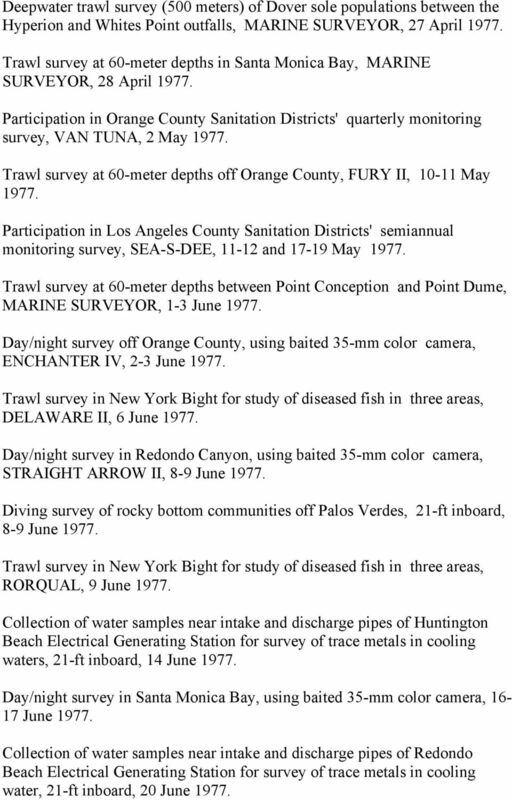 6 Trawl survey at 60-meter depths between Dana Point and U.S./Mexico border, FURY II, June 1977. NOTICE OF THE CLASS DISTRIBUTION PLAN. A court has authorized this notice. This is not a solicitation from a lawyer. Exploring the World Classroom Activity The Classroom Activity introduces students to the context of a performance task, so they are not disadvantaged in demonstrating the skills the task intends to assess. O U R C O M M U N I T I E S T O W A R D A H E A LT H Y, T O X I C - F R E E F U T U R E.
Orange. County. Reclamation Plant No. 1 Treatment Plant No. 2. La Habra Brea. Fullerton Placentia Anaheim Villa Park Alamitos. Mission 4: Fossil Fuel Power Stations What are Fossil Fuels? It says here that electricity is made in a big factory called a power station. It is made by burning fossil fuels. So what is a fossil fuel? Program Overview. Automobile/Automotive Mechanics Technology/Technician in Los Angeles County, CA. EMSI Q2 2015 Data Set.